This week’s readings, particularly the primary source texts, provide a window into Istanbul’s agricultural past. Through the Typikons of the monastery of St. Mamas and the convents of Lips, Kosmas, and Damien, and in the surveys of both 1455 and 1735 – along with the highly detailed advice of the Geoponika farming handbook – we glean valuable data and context regarding the agricultural production of the day and the farming practices as well as the diet of Istanbul’s citizens. In the survey of Istanbul of 1455 (Inalcik), we are provided an evaluation of the city, broken down quarter-by-quarter. We learn the number and size of its houses and the identity, professions, and religious profiles of the inhabitants. Interspersed with this detail are references to other structures from which we can glean information about the city’s agricultural production. For example, the survey contains references to the city’s gardens, vineries, stables, storehouses, mills, and wells, including their placement within certain quarters or neighborhoods. Some quarters or districts had little or no agricultural activity to speak of. Others, particularly those housing the city’s many monasteries, were clearly successful centers of food production. For instance, we learn that Quarter Balat II housed two gardens along with a citizen named “Ripotos,” identified as a gardener (Inalcik, 306-98); that Quarter Bab-i-I Edirne housed the evidently productive Monastery of Prohermez, which counted among its holdings three storehouses, and a vinery (313); that Quarter Top-Yikigi was home to two mills and a garden (327-335), and that Quarter Alti-Mermer had a garden, a mill, and a well (347-350). Quarter Kastel Hirige featured a monastery with four storehouses, stables, and two vineries (352); the Ayos Athanos monastery held a vinery and a storehouse (357), and Quarter Isa-Kermesi housed a factory for making linseed oil (358). The 1735 survey of the bostans of Istanbul, covering the neighborhoods of “Great Langa,” Kucuk, Yedikule, Ynibahce, and Cukurbostans, documents the continuing, indeed growing, prevalence of agricultural production in Istanbul. For example, we learn that there were 1,381 gardeners resident in the city, the vast majority of them Christians, tending over 344 individual bostans (1735 Survey of the Bustans) – not insignificant figures, particularly when compared to the greatly diminished numbers of the present day. In the Typicons documenting life in the city’s monasteries and convents, we can glean further information about the food production and consumption of Istanbul’s population. First, we learn that the Convent of Lips employed a steward to oversee its various land holdings; the steward’s salary consisted of gold and “100 annonikoi modioi” each of wheat and barley, and “100 measures of wine” (Thomas & Hero, 1272). The Convent’s “Inventory of Property” provides an accounting of its vast agricultural holdings including many thousands of modioi of “arable land,” vineyards, gardens, and mills (1279-1281). 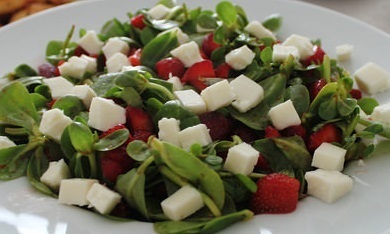 The document goes on to provide a detailed recitation of the diet allowed the nuns, specifying “fish, cheese and legumes” on non-fast days; legumes, vegetables and “seasonal shellfish” on Mondays; and other days on which only “vegetables and legumes” were permitted (1258; 1275). The Typicon for the Monastery of St. Mamas provides an even more detailed prescribed diet of the monks, even specifying the manner in which such food should be prepared, to wit: “…two of three cooked dishes containing olive oil” or a meal “… composed of “legumes soaked in water and perhaps some raw vegetables and fruits” (Thomas & Hero, 1006). Clearly, the inhabitants enjoyed a varied if highly regulated diet. Perhaps the most illuminating document to provide insights into the nature of farming in 10th century Istanbul is the Byzantine Greek farming manual Geoponika. 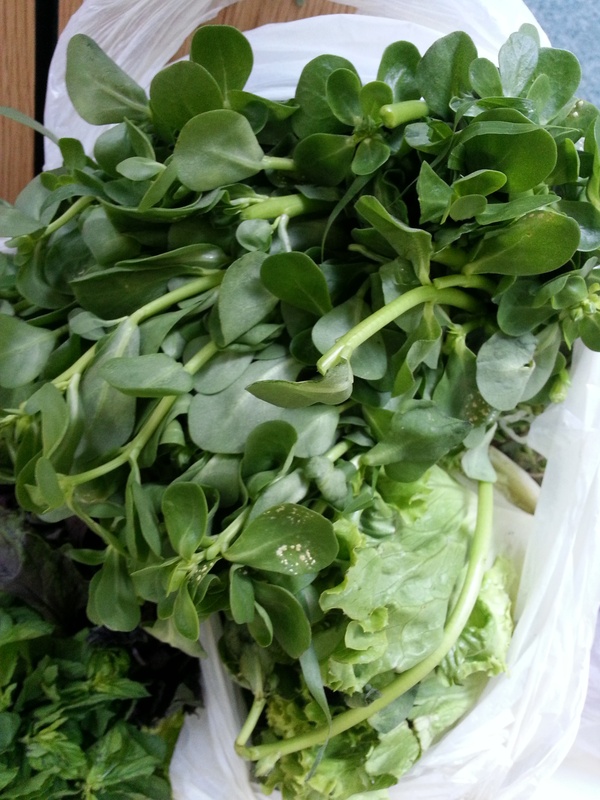 From Book 12 we learn exactly what crops Istanbul’s residents were growing and consuming: beets, lettuce, cabbage, melons, turnips, mint, celery, leeks and onions, garlic, artichokes, mushrooms, and asparagus. We also learn the best soil for cultivation – non-clayey and “not too rough” – as well as how manure (the best being ash and pigeon dung) can be used to work Istanbul’s “clayey” soil and how the region’s sandy soil should be used to grow asparagus (Dalby, 248). 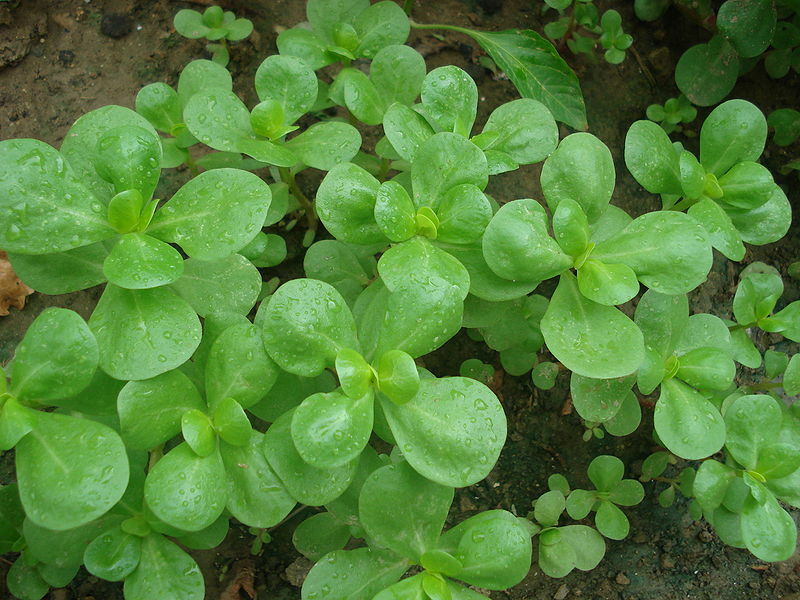 Among the manual’s encyclopedic recommendations for addressing seemingly every conceivable cultivation, pest, and medicinal issue are a number of hygienic properties ascribed to certain plants – an emphasis on personal hygiene being central to the lives of city dwellers living in close proximity to one another. 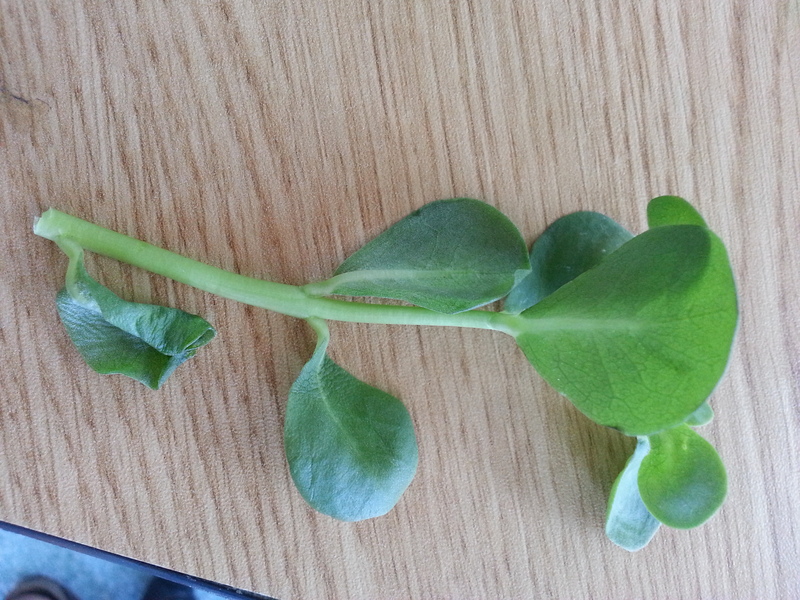 For example, rocket is described as being useful in cleaning up facial blemishes; it also “helps with smelly armpits” (261). Book 12 also highlights the importance of gardens in proximity to the house, noting the gardens provide pleasure to the senses of sight and smell. The existence of texts like Geoponika and The Vienna Dioskorides highlights the important role of agriculture: “the extent to which people believed in the power of plants, and in the ability of men and women to harness that power” (Brubaker, 213). Finally, the examples of Ottoman historical literature included in the readings – for example, Hyrtakenos’ description of the garden of St. Anna, capturing the “science and art” of Byzantine gardening (Dolezal and Mavroudi, 115-118; 140-148) – provide further evidence of the importance of land cultivation in Istanbul history and culture. In addition, literature like Hyrtakenos’ Description of the Garden of St. Anna highlights another aspect about gardens that is frequently neglected: the spiritual feeling a garden can induce. While many sources on bostans focus on the production aspects of urban farming, Hyrtakenos’ detailed prose reminds us that gardens also possess authentic aesthetic qualities, and that the emotions evoked from merely being in the presence of nature’s beauty can be just as valuable as a garden’s tangibles products. These texts, while not necessarily set down for the purpose of telling the story of agriculture, nonetheless provide myriad clues to the agricultural heritage of Istanbul. They serve as an ekphrasis – a graphic, dramatic description of the city’s powerful agricultural past. As a field trip for the course, we went Yedikule, to see the bostans that still exist and the areas that were bostans before. To make a comparison on what is changed and what remained, in a place where used to be a bostan, we took pictures. 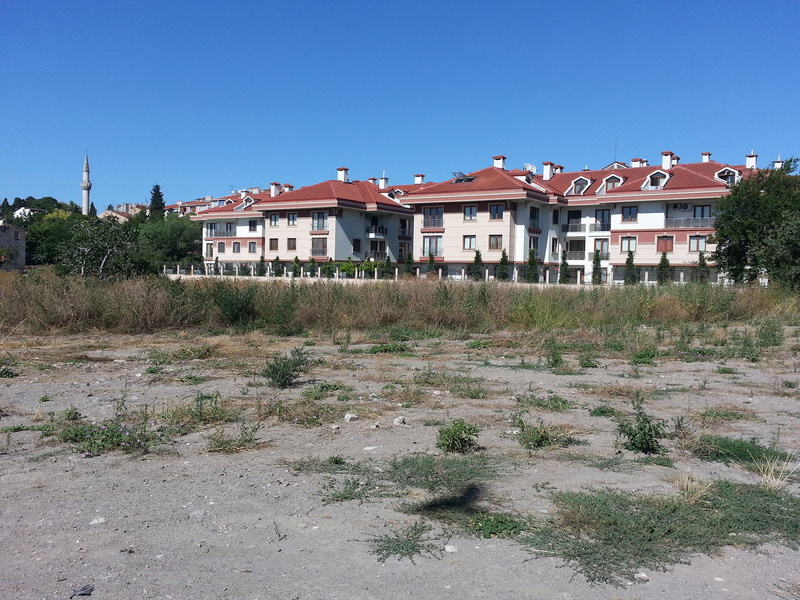 Having three other photos of the land from past, it became possible to capture somethings with different pictures from different times, around the same point, depicting the situation of green lands under the conditions of different Yedikules on relation to different Istanbuls. The first one from 1890s is an Istanbul of late Ottoman Empire, in a setting where agricultural production still has its primary value. From the mosque and the houses around, it can be understood that there is a neighborhood. Of course, the bostans are occupying the hugest part of the picture. Also, aside from the bostans, the number of trees is considerably high in comparison to today. The photo gives an impression of an immeasurable land which seems to have no end. The second and third ones are from 1930s, from the early times of Republic of Turkey when there is a shift happening from the imperial times and practices, changing the city life and people’s occupations. In Artamonoff, February, 1937 and Artamonoff, 1938, more houses can be seen than the bostans. The trees are still there. However, probably due to the the point of view or maybe the season being winter, the photo from 1937 looks drier. It is like the occupation of the settlements started to grow around the whole area. The limitlessness in the late 19th century photo seems to come down to the feeling of vastness. The fourth one, taken in 2014, belongs to a more globalized, modernized Istanbul and its needs. There is no bostan at all. There is only the dry land with the houses. Some trees are still there. One of the last set of settlements as a building complex, that can be seen in a fifth picture is surrounded with walls due to probably security reasons. That is like marking the line between nature and concrete. The funny thing for me was to see the trees planted between the barbed wire and the houses. It is also the barbed wire in between the natural land and the planted trees that is likely for the sake of avoiding the settlers at the lower levels seeing only the wires as a view while looking through their windows. Furthermore, the land is now limited with the limits of a modern city. From the ground, it is unlikely to see anything beyond -if not a long tree- if there is a building in front of you. And looking from top of the walls, only feeling is the feeling of a city and it is possible to locate some important places from that height. 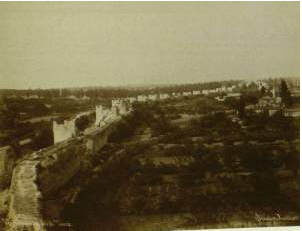 After we talked about the one big constant being the city walls in all the photographs, I also realized, they were built in 5th century, and up until 20th century, they contributed to the “immeasurable” or “vast” outlook of the city. Only at the time when people built things that made the walls cannot be seen, city stated to look more intense but smaller. Istanbul’s bostans that were sustainably farmed to maximize harvests had gardeners that were experts but also had their guilds. While we were walking around the area with second and third generation farmers who once owned a land and now lost some of it and facing to lose more, it is not seem to be an organization as guilds that would protect them or give some community spirit to the situation, within the bostancıs, at least. Considering their one of the biggest problems as the uncertainty of their situation due to on-going projects considered for their lands or their changes in the value of their products’ in the market, the organization thing becomes more significant. According to Kaldjian, views perceiving Istanbul’s bostans as archaic, with no place in a modern world city, capable of producing little more than a nostalgia, is shallow and suggest a limited appreciation of creative community building and smack of misplaced elitism. Moreover, looking at the photographs, there is an obvious loss of green area with an ongoing settlement expansion. Having said that, my main question here is; can a modern city and nature exist together or nature should be adjusted to the modern without reminding its non-modern timeless feature; but also since every case is unique, what can be the case for Istanbul, a city of bostans and gardens from the first place? Paul J. Kaldjian, “Istanbul’s Bostans: A Millenium of Market Gardens”, Geographical Review, Vol.94, No.3, People Places and Gardens (Jul.2004), 285 and Gülru Necipoğlu, “ The Suburban Landscape of Sixteenth-Century Istanbul as a Mirror of Classical Ottoman Garden Culture”, in Theory and Design of Gardens in the Time of the Great Muslim Empires, ed. A. Petruccioli, E.J. (Brill, 1997), 44. These issues are debated in the articles, on the situation especially after 1990s, by Paul J. Kaldjian, “Istanbul’s Bostans: A Millenium of Market Gardens”, Geographical Review, Vol.94, No.3, People Places and Gardens (Jul.2004), pp. 284-304, on the comsumer city idea by C. R. Whittaker, “The Consumer City Revisited: The Vicus and the City”, Journal of Roman Archaeology” 3,(1990), pp. 110-118 and also especially for the Ottoman Case and its relation to current issues by Aleksandar Shopov & Ayhan Han, “Yedikule Market Gardens and the New Istanbul Topographies: Expansion of Agricultural Land in Ottoman Istanbul in the Seventeenth Century”, pp. 1-14. Paul J. Kaldjian, “Istanbul’s Bostans: A Millenium of Market Gardens”, Geographical Review, Vol.94, No.3, People Places and Gardens (Jul.2004), 300. Change and continuity. Those two words epitomize both the community of Yedikule and the story that is modern Istanbul. If a picture tells a thousand words, then these four images of the same Yedikule bostan and the community that surrounds it – taken at intervals over a 125-year period – captures at one glance the extraordinary changes that have overtaken this historic city in recent decades. Istanbul’s bostans have largely fallen victim to the engine of Istanbul’s economic success: a globalized economy, many major construction projects, rising land values, and an increasingly urbanized population no longer interested in farming as an occupation all have contributed to the demise of the bostans that were once such a distinctive feature of this city. However, Istanbul is a city featuring elements of timelessness and continuity as well as change, and these photos capture that element as well. While the ancient city wall continues to stand in surprisingly good condition, the bostans have largely disappeared from these photos and the Istanbul landscape as a whole. However, there is still some space for their return – literally and metaphorically – provided that the case for their continuing social and economic value is made and accepted. 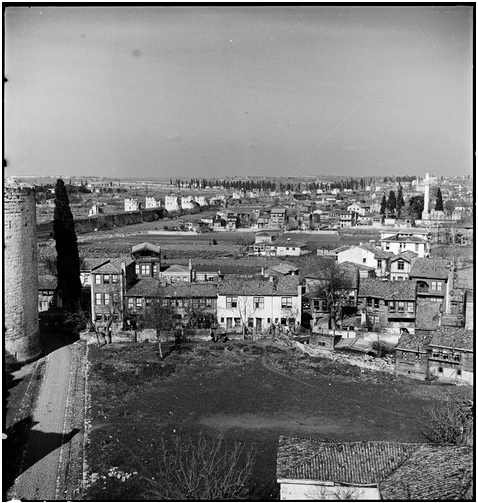 When we look at Sebah’s photograph of Yedikule from the 1890s, we see an area characterized by greenery. This is not the open, largely barren landscape we see today. 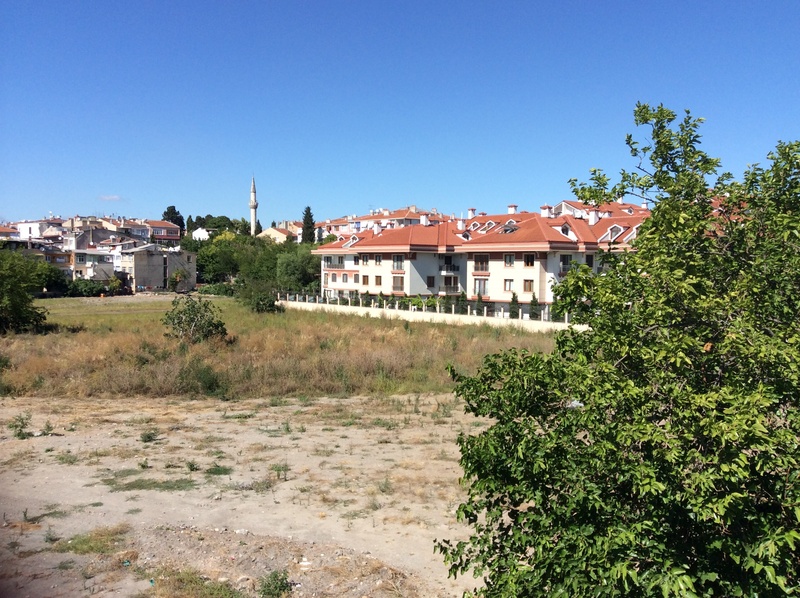 Rather, Yedikule is lush and forested – cultivated fields are interspersed with dense tree cover. An imposing line of cypress trees – like an advancing army – appears in the distance. Aside from the historic city wall, the land is largely undisturbed by human structures – a few modest houses can be seen, mostly to the left of the wall, and the spire of a mosque appears in the distance. However, though indicating the presence of a community, these buildings are secondary players in the scene depicted – here, nature and farming predominate. Although the colorless photo is old and grainy, the lushness, vitality, and abundance of the land is palpable, as is the respect and reverence it is accorded. Turning to the photographs from 1937 and 1938, we see the same land almost fifty years later, though it might take a moment to realize it. The once largely rural, arboreal vista is no more. Artamonoff’s photograph, taken in February when the earth is barren and the trees skeletal, highlights the disappearance of the tree cover and general foliage, but the observation holds true for the summertime 1938 photograph as well. The supremacy of nature that characterized the 1890s landscape has been transformed by the late 1930s into a landscape of cultivated plots contained by a growing urban presence. Most of the trees have been replaced by houses, and the land that appears here has been tamed into smaller, controlled plots. The once-mighty army of cypress trees on the far hill has been significantly thinned, though it still stands. However, while the landscape has changed, the continued presence of the bostan fields, and the evident care in their cultivation, is testament to the continued importance of farming to the Yedikule community, despite the encroaching development. And although more buildings have been constructed, the “sacred space” for the gardens between those buildings and the city walls so prominently featured in Sabah’s photograph has been maintained. Fast-forward to 2014, where I stand on the same ancient city walls featured in Sebah’s photo looking out onto… what, exactly? It is not immediately clear. Aleksandar walks us through a guided-meditation description of the once lively garden that occupied the space before us only a year earlier, but it is difficult to imagine that anything once grew here – even the weeds seem to be having a difficult time surviving in the dehydrated soil. A dense colony of buildings has now managed to extend its presence nearly to the edge of the wall, and there is not a garden in sight. Looking out onto this arid urban wasteland, one wonders: what will become of this former bostan? Will the results of the city’s development plan – detailed on a billboard located somewhere on the lot – be able to replicate and/or surpass the vibrancy of the former farming community? The changes to the landscape I have identified in comparing my 2014 photo to the photos of previous years are not shocking. It is not uncommon for cities to change, and while change is not a perfectly linear process, patterns and trends – such as a general shift away from the prevalence of agriculture – can be observed. 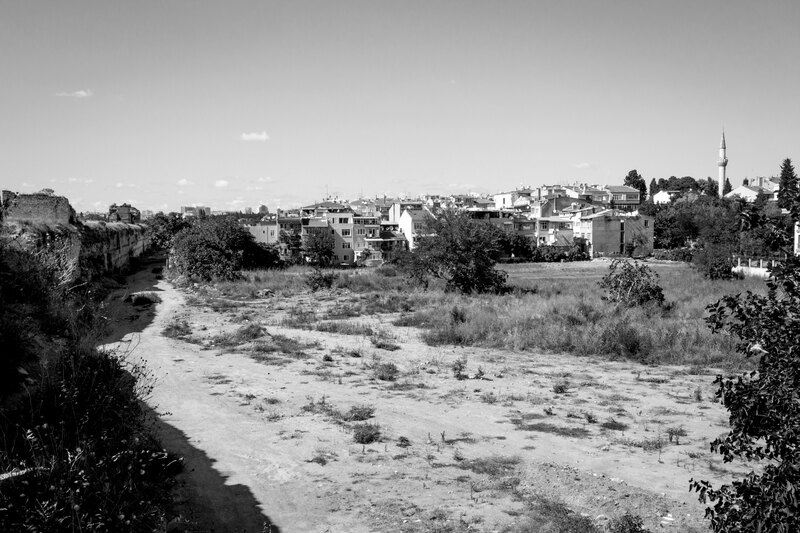 However, what is shocking about the differences observed in Yedikule over the years that we have seen photographed is the fact that the vast transformation of this landscape has occurred largely in recent years, when the assault against the bostan began in earnest. That an Istanbul institution that survived for centuries could be largely destroyed in such a short period of time reveals how quickly history can be erased. And it also reveals just how quickly the defenders of the bostans will need to move if they want to save them. What is truly fascinating and surprising to me upon close examination of the images of Yedikule Gardens, the gardens that sit near the intersection of the Theodosian walls and the Marmara Sea in the Fatih neighborhood, are the similarities in the images of the region taken in the 1890s, February 1937, 1938, and today in July of 2014 (see below for images). 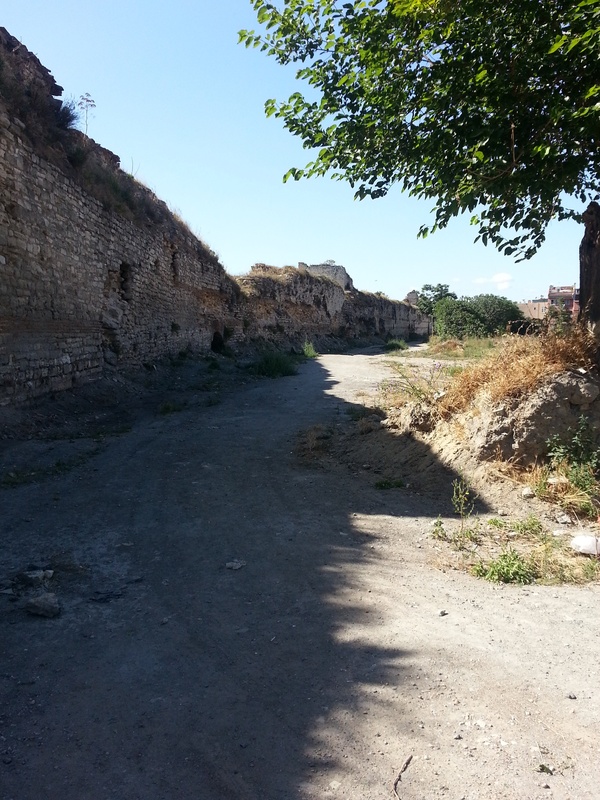 In all the photos, the Theodosian Walls and the surrounding structures, built around the 5th century by the Romans to protect the city, are present. From the images, it is as if the part of the Theodosian Walls that border the Yedikule garden are meant to protect the garden. Perhaps this is due to the contrast in size of the tall walls to the large, lower expanse of ground with much shorter houses beyond. The relative strength in height of the walls is not only meant to keep intruders out of the city but also to keep intruders away from anything near the walls. 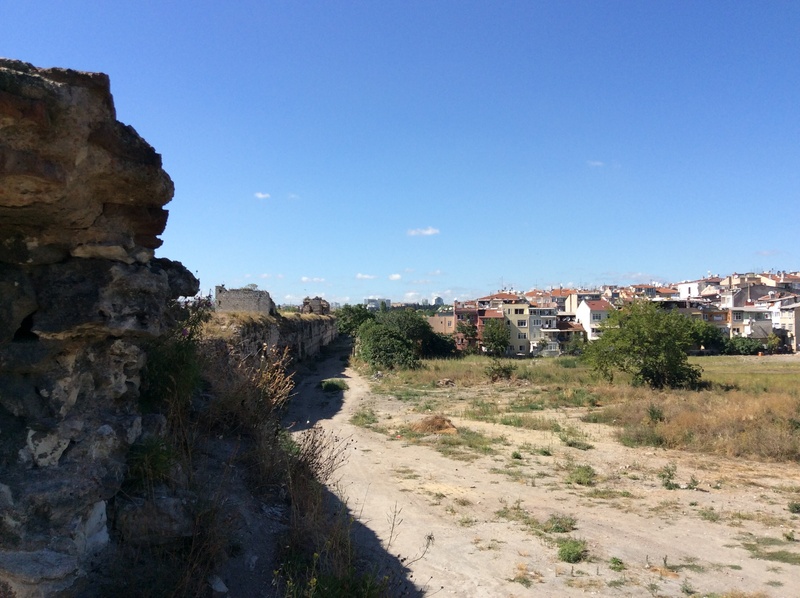 Interestingly, the Yedikule gardens lie on the side outside the Theodosian Walls but the power of the wall still seems to be threatening outsiders from approaching. Or is the outsider in this case the inner city of Istanbul? 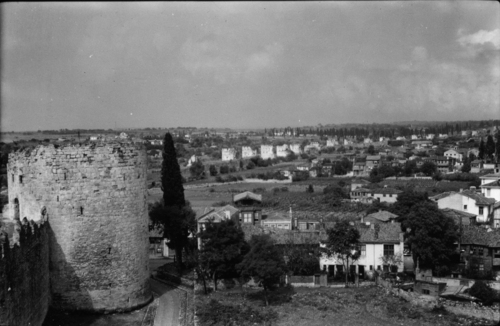 It is as if the Theodosian Walls are meant to protect aspects of the city of Istanbul from itself as the beautiful antiquity of the Walls denotes a preservation of history, which the Yedikule gardens embody, and which the city’s desire to develop the area into a modern recreational area does not. Not only do activists fight to keep the gardens alive and prevent the city from destroying the gardens but the loud, inanimate Walls do too. While the images appear quite similar to me, a few differences can be detected. A difference in the landscape of the area can be seen when comparing one photo to the next. The multitude of trees present in the 1890s image is invisible in the 1937 and the 1938 ones, paving the way for garden space. 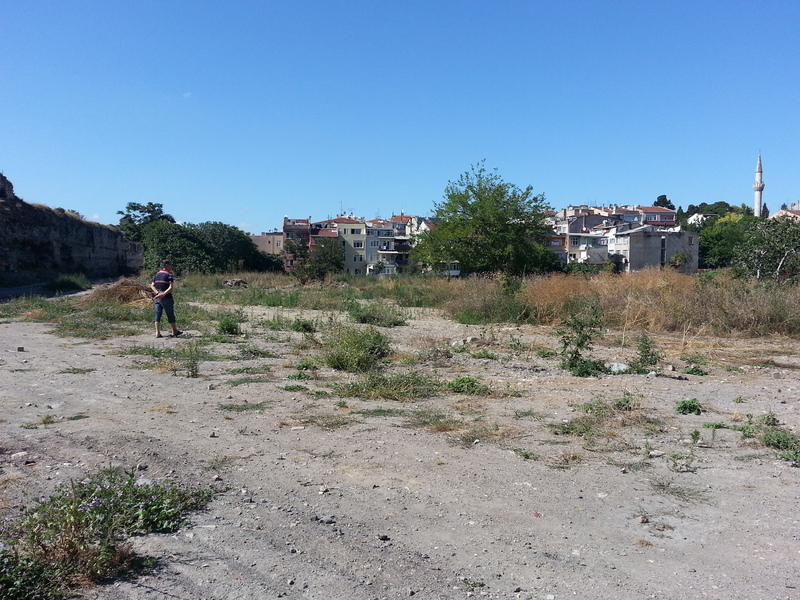 Current images of the area show the abandoned and uncared for former gardens standing right between the same Walls and houses (with some developments) as if begging the question of why everything surrounding the gardens has been preserved while the continuation of the gardens is in question today. It is clear that gardens have been present throughout Istanbul’s history beginning in the Byzantine period and during the Ottoman Empire. As Aleksandar Shopov and Ayhan Han write in their paper “Yedikule Market Gardens and the New Istanbul Topographies: Expansion of Agricultural Land in Ottoman Istanbul in the Seventeenth Century,” according to one document from 1735, 344 gardens existed with 1381 people employed within Istanbul (Shopov, Aleksandar and Ayhan Han, “Yedikule Market Gardens and the New Istanbul Topographies: Expansion of Agricultural Land in Ottoman Istanbul in the Seventeenth Century,” 3). While mentions of the Yedikule Gardens from certain time periods are lacking as Shopov and Han write, the Yedikule Gardens carry Istanbul’s history of gardens in one of the few gardens still remaining (Ibid, 3-4). In Henry Maguire’s essay “Gardens and Parks in Constantinople,” he speaks of the strong presence of gardens throughout the Byzantine empire evidenced through many writings despite the lack of them still standing (Maguire, Henry, “Gardens and Parks in Constantinople.”). And in Gulru Necipoglu’s piece “The Suburban Landscape of Sixteenth-Century Istanbul as a Mirror of Classical Ottoman Garden Culture,” he speaks of the great role gardens played as spaces not only of economic growth but of leisure, relaxation, and enjoyment (Necipoglu, Gülru, “The Suburban Landscape of Sixteenth-Century Istanbul as a Mirror of Classical Ottoman Garden Culture”). Thus, when looking at the images of the Yedikule gardens overtime, the tall Walls seem to reinforce the importance of the Yedikule Gardens as a space of great history and antiquity.